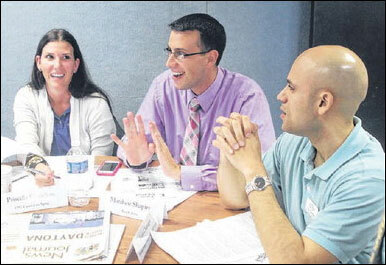 Rice and Rose attorney Matthew Shapiro recently appeared in the Daytona Beach News Journal as part of a feature on the Daytona Regional Chamber of Commerce’s 33rd annual Leadership Daytona class. Leadership Daytona is a three month program designed to inform participants about various aspects of the community as well as to enhance their personal leadership skills. Discussing their front-page design at an editorial meeting are, from left, Priscilla Chanfrau of the YPG/Council on Aging, Matthew Shapiro of Rice & Rose and Luis Chanaga of Florida Hospital Memorial Medical Center. Home Co-Ownership - You May Need An Attorney!